For some people, Christmas is not the same without at least listening to The Nutcracker Ballet by Tchaikovsky. In my opinion, it’s one of those pieces of classical music that every child should be able to identify. There are a lot of ways to incorporate learning about this piece that go beyond just listening. 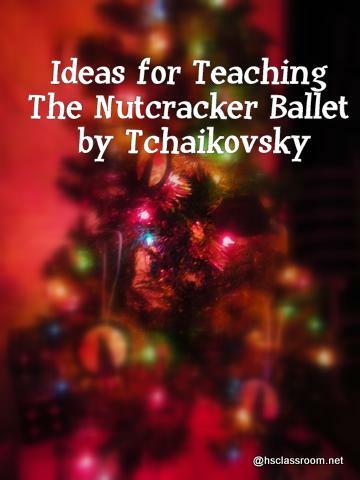 Whether you are musically inclined or not, here are some easy ideas and hands-on activities to teach kids about The Nutcracker by Tchaikovsky. In English, we sometimes call him Peter Tchaikovsky, instead of Pyotr or Piotr. Piotr Illyich Tchaikovsky on Classics for Kids – This is one resource form a great program that introduces students to composers and their music. On their site, you can listen and learn all about Tchaikovsky and his music (plus lots of other composers throughout history). Making Music Fun has composer bios as well as printable solo piano music for various movements in the Nutcracker Ballet. Make a Biography Page about Tchaikovsky – At the site Practical Pages, there are free downloadable Composer Biography Notebooking Pages. Nutcracker Drawing Lessons – Art Projects for Kids has several great drawing and pastel nutcracker projects. Make a ballerina snowflake with the directions and templates from the Crafty Tipster. The Nutcracker by John Cech – This version is longer with modern illustrations. Quite a different approach than most traditional Nutcracker books. The Magic Nutcracker by Margaret Hillert – A beginning reader version. Ask the students what mood they think this piece of music will have (happy, sad, excited, etc.). Listen to the piece and then discuss. This is a great activity to do with any of the pieces from the Nutcracker Suite. Have students dance pretending to be their favorite toy. Watch a video of the dance. Talk about the celesta, the keyboard instrument that gives this dance a unique sound. Click here for a great deal of information on the celesta as well as a video with great audio examples of the instrument. This is my version of a listening map to the Trepak. All it took was some poster board, markers (or crayons), and time. Talk about form- AABA and the instruments they are hearing in each section. The A section is primarily violins whereas the B section is violas, cellos and reeds. Have students divided into 2 groups. Use rhythm sticks or drums for the stars on the map and shakers or jingle bells for the circles. Then switch. Talk about dynamics as the song increases in volume toward the end. Assign students A or B section, then have them move on their particular section with scarves or ribbons. I’ve made ribbon sticks easily and inexpensively by tying various lengths of ribbon to dowel rods or even rhythm sticks. Dance the Trepak while listening. This is a great workout for teachers as well. Listen then compare and contrast between the two pieces. Have student fold a piece of paper in half. On one side, while listening to the Arabian Dance, draw what they feel. Then do the same while listening to the Chinese Dance. Compare and contrast the drawings. Dance with scarves pretending to be flowers. If you don’t have access to scarves, you can have the kids do a pat-clap-clap rhythm pattern during the song. I hope you enjoy this piece of music as much as we do! I would like to have a copy of your Nutcracker teaching unit with vocabulary list/word cards. We don’t have a product like that, but we’ll consider it for the future. Thanks!